I recently added some more radio gear to my ever growing collection which comprises of a few more antenna's and a Ft-1000MP Mark-V to help bow the shack table some more. I strung up a Carolina Windom 160 by Radio Works last weekend which joins my collection of home made delta loops, wires, beams and verticals. You can never have too many radios or antenna's hi hi. 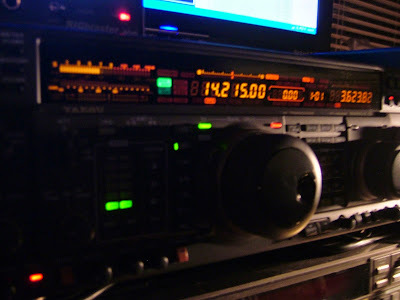 Since the the CW160 was up I have made lots of great QSO,s on 80m, 40m, 20m, 17m, 15m & 12m. I have yet to try it out on 160m, 30m & 10m but the results so far on the other bands have been very surprising. The antenna is 265ft long and is suspending by trees in a more or less straight line and it is nice and stealth like not causing any complaints so far which always helps to keep things peaceful. The new addition - Yaesu Ft1000MP MK-V fine tunes the antenna well using the onboard atu, the antenna is less than 2:1 at worst across all of the HF bands and is at 1:1 on 160m without the atu in its present configuration. I've put good signals into K, VE, CO, 7V & CU on 18m using the CW160 and WX, K, TR, VO, VA, CO, & VP on 20m. VP also on 12m. On 40m & 80m the CW160 is working as expected putting out a big signal whilst receiving a very low noise level, I have heard plenty of JA coming in on both 40m & 80m at around 5/7 signals. 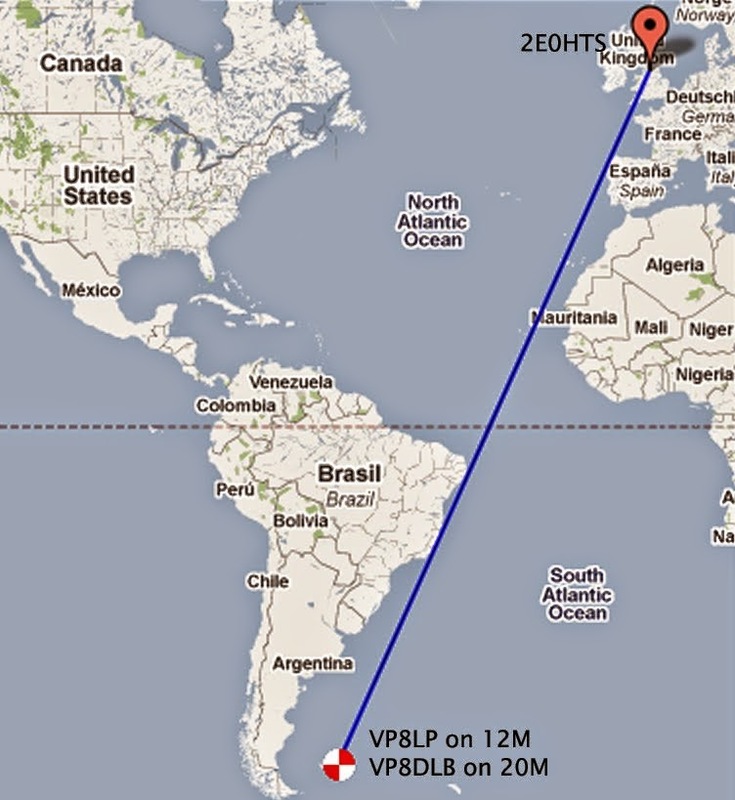 The highlight of this weeks radio activity from the shack has got to be working TR8CA - Gabon on 14MHz and best of all was VP8LP - Falkland Islands on 12M where I got to work bob for a second time at a distance of 8000 miles. 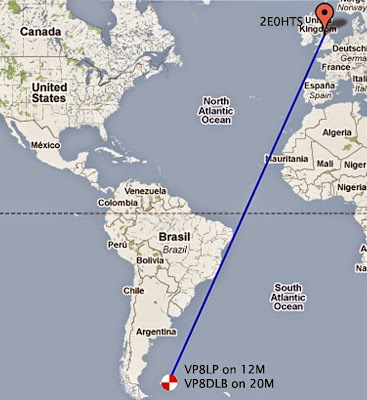 I got lucky again Saturday evening on 14MHz and managed to work VP8DLB also on the Falkland Islands. The picture below shows the MK-V receiving VP8DLB - Gary at 5/7 through the CW160 which at the time was the strongest performer out of my Hustler 6BTV and Delta loop which I kept switching between. I am really enjoying some of the nice openings that have been happening of late with QSO's over very long distances becoming a daily occurrence, I have also worked a few nice openings into VK from the mobile again, whilst driving to work in the mornings. Hope to catch some of you somewhere on the bands, thanks for passing by & best 73. Good DXing! As well as Ham Radio I have had a history of playing music - DJing on local community broadcast stations. I was involved with a local station for over 15 years before I got my amateur radio licence, broadcasting live to about 250,000 listeners three times a week never missing a show. So as you can imagine I have an extensive collection of Vinyl recordings. To sum it up, if I ever melted them down I would have enough plastic to manufacture 10,000 hand held microphones. 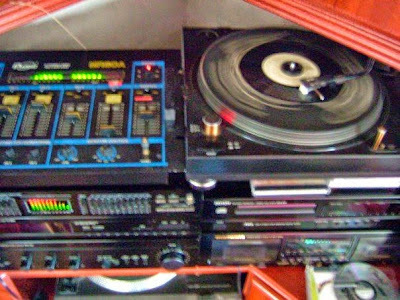 On a more serious note I try to spend the odd weekend playing some of my records and at the same time I have the PC interfaced to my sound system allowing me to convert the tracks to mp3. I have had my "HI FI" equipment for over 20 years and it still sounds as solid as ever. It is connected to some PIONEER CS-777 speakers powered by a DENON PMA350 amplifier. I still have some 22" base boxes fitted with horns that I can "string up" if needed for venues etc. I obviously don't listen to music when I am active on the bands but in the future I might consider using some of my HI FI equipment such as a mixing desk and a graphic equaliser in the shack. I think it could be interesting to see how I can experiment around with my audio settings. A mixer will allow various microphones and the rig-blaster to be easily faded in or out when required using one output/mic lead. I will also have the capability of recording stations directly to my PC with instant replay possibilities. So a next project in amateur radio brought to me whilst listening to some good old Reggae! As far as making QSOs I have had quite a few good long path QSOs into VK recently from both the shack and the mobile on my regular favourite band - 20M. Up here in the North of England I've found the best time to work long path stations seems to be from 7.00 utc up until 9.30 utc. I have also been regularly hearing good openings into JA and State-side on 17m quite a lot lately during the day time. Hope to catch some of you on the bands during the evenings and weekends. I will try to post a bit more regularly again now that the Summer is almost at an end (my motorcycles will be getting less of my attention).